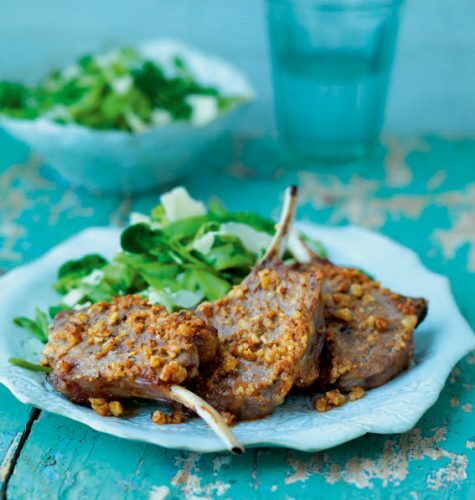 The noissette of lamb is a very tasty dish that will satisfy even the hungriest family. Cover the lamb noissette in the oil and cover with sea salt pepper and garlic and place in a roasting dish and cover with foil. Place in hot oven (200 degrees conventional/180 degrees fan oven/ gas mark 6) for between 45 mins to 1 hour 15 minutes depending on how pink you like your meat. Once cooked allow to rest for 20 minutes; for the sauce use the oven tin used to cook the meat so you can make the most of the flavour of the meat and garlic. Add the stock & mushrooms to a pan and reduce for 10-15 minutes before adding the cream. Once you have added the cream make sure it does not boil or the cream will split. Add the mustard and basil and stir until dissolved. Cook the pasta for the required time, strain and then add the pasta to the sauce and serve with the meat. To prepare the butter; place all the ingredients in a food processor or blender and process until blended. Put the mixture on a large piece of cling film or foil and mould into a sausage shape. Chill until required. Season the cutlets or chops and cook under a preheated moderate grill for 6-8 minutes. Turn over and cook for a further 3-4 minutes. Top each of the cutlets or chops with a disc of the butter. Return to the grill and cook for another 3-4 minutes. Serve with crusty bread, any meat juices from the pan and the griddled asparagus with shaved Parmesan. If preferred use sun-dried tomato paste instead of sun-dried tomatoes.